Loved this class and would highly recommend. She was friendly, informative, and funny. Well organized. The visit to the souk to grocery shop was great fun. It got off to a rough start when our guide was 30 minutes late and not the least bit apologetic. She had a disinterested attitude that was disappointing. However, once we got to the souk it was great fun. We arrived at a clean fairly basic riad where the chef took over. She was wonderful and it was great fun to prepare the ingredients for a tomato salad and chicken tangine. As the food cooked we went up to the roof and sat in the sun with a wonderful view of the city. When we sat down to lunch, we very much enjoyed the meal. The chef provided a running commentary that was interesting and fun. 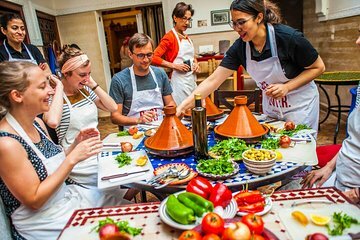 5 of us joined a Cookery Activity in Marrakech. It started a bit slowly, as the stalls to buy Chicken (definitely fresh!) and vegetables opened later than usual that Sunday. 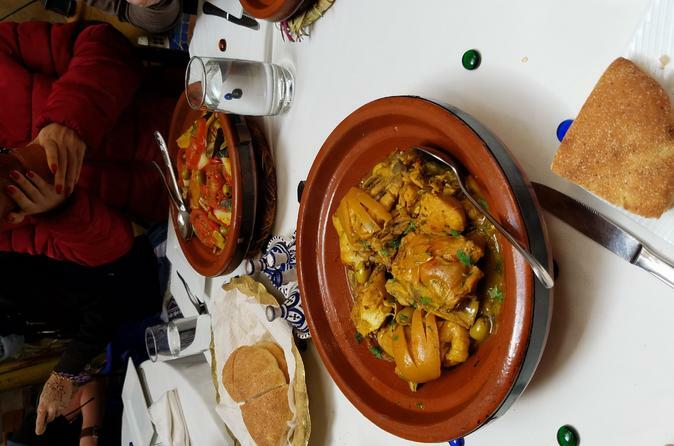 However, in the end this added to the experience with an extra 30 minutes of people and activity watching.Then we went to the Riad and met with Karima, who instructed us on cooking a Chicken with Lemon and Olives tagine, plus a Moroccan salad and dessert. We cooked in twos, so with the 11 total of us, we ended up with 6 simmering tagines.Had not eaten breakfast , so we were all very hungry and the tagines more than met our expectations.A very enjoyable 4 hours taking us to early afternoon that I definitely recommend. The guide was late showing up which made me a touch nervous, but there were other people there waiting as well. She was fabulous and you have to wait until the butcher is open anyway. So, no worries. The experience was amazing: the people, the guides, the food! Highlights: Well-organised cooking class, clear communication during cooking class, instructor was engaging and knowledgeable, shared interesting facts about local culture, small class size, and dishes chosen to be prepared are well-curated, site of cooking class had nice ambience and well-appointedLowlights: Instructor came in 25 mins late from advertised/agreed call time. Difficulty in reaching the tour company with contact details provided. We met at the market and went shopping for the ingredients and then went to a Riad to cook. It was very organized even though there were about 15 people in total. We had fun getting to know others and cooking a new dish! Great experience for our family of three, including a 13-year-old child. Great guide, great venue, and delicious recipe / lunch. Highly recommend this experience. Highly recommend taking cooking class in Marrakech especially from Karima under Urban Adventures. She provided a wonderful learning experience while purchasing fresh produce and poultry in the market and preparing/cooking the tangine Riad Thycas. We had a group of 10 people which was a good size for this class. For our group, we met at 0900 and left her Riad by 1400 well fed. We cooked chicken and vegetable tangine with lemon. I under estimated the veggie tangine but that was tasty and the first to be fully consumed. YUMMY. Word of warning, the poultry was 'fresh', 'very fresh'. We met on time on the agreed spot and went directly to the market. Packed with all the fresh ingredients we walked to the place where we started the preparation. We were a great crowd from all over the world including Fatima and her colleague who showed us how to prepare and cook a real Moroccan tagine. I have never tasted such as delicious meal before and after I went to this great cooking class. It was just two of us on the tour and Karima was a great guide. Started out with getting fresh ingredients including a poor chicken and then taking them to a Riad and cooking. It was a great experience and the tagine turned out really great.